Chinese snapshot is back with this incredible picture that was taken by one of my friend in Shanghai streets. I shared last year one waste collector in Beijing streets that transport huge amount of garbages. This one beats all records. 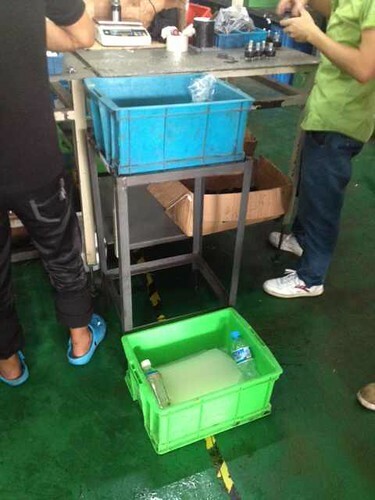 Incredible China – example 23: heat in the factory! Winter is coming but temperatures are still high in Southern China. One of my friends just sent me couple of pictures from his industry. The workers decided to implement their own air conditioning system to reduce the incredible heat inside their factory; ice in a bucket. Incredible China – example 22: Chinese power is everywhere! 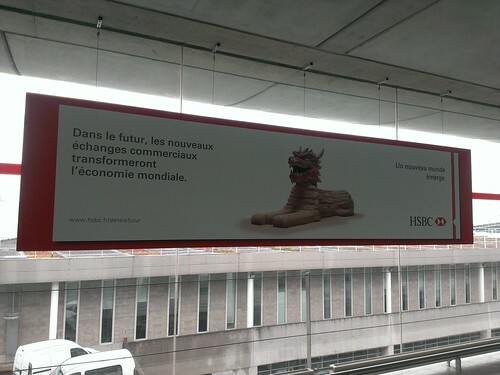 “Incredible China” series continues even in France with a snapshot that I took in CDG Airport, Paris. HSBC, the most famous hongkongese bank uses nice PHOTOMONTAGES to promote their international services. The renovation work in front of Phoenix City has started when I moved in this neighborhood (September 2011). The initial plan was to open a new subway exit for Sanyuanqiao station for Chinese New Year 2012. Couple of weeks ago, it was not finished yet and the subway station exit was still closed. 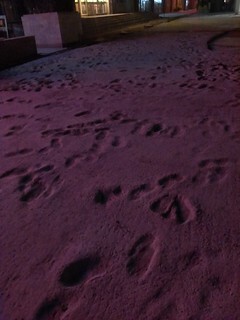 The new joke from the workers happened when they started to pour concrete on the pedestrian street to the subway. 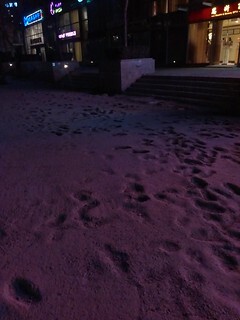 We can believe that those marks are footprints in the snow but that’s not the case… dozen of persons walked in the fresh concrete as no indication warned them. It remembered me an old post in Incredible China series where I described the workers’ effective working time (24/7). How workers can be effective and conscientious with this working rhythm? I was in the supermarket closed to my apartment couple of weeks ago because I wanted to buy a new wok, the big chinese pan. I walked in the kitchen part and I found the kitchen tools shelf. 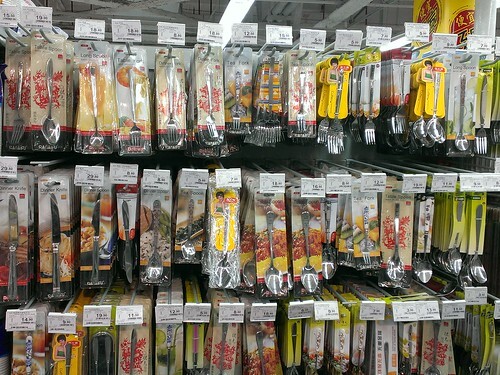 Of course, most of the tools are chopsticks. Every sizes and colors are available. Nearby, I discovered something really strange. All the forks, knives and spoons are sold unitary. You can buy one fork or one spoon! Today, I write an “Incredible China” linked to my work! 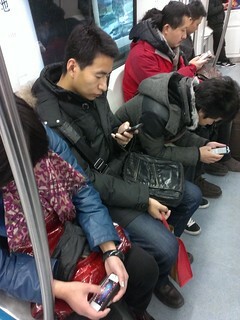 People in China get a dangerous addiction to their mobile phones. 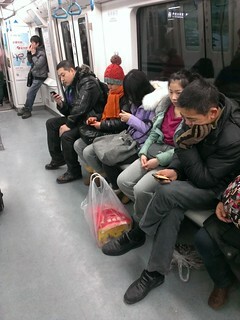 This is common to find everybody around you with their devices in hands. They are chatting, playing or watching a movie. 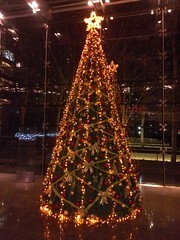 Incredible China – example 18: Christmas spirit is booming here! Year’s end celebrations are around the corner; Beijing made this year a great effort to develop the Christmas spirit or 圣诞节 (Shèngdàn jié) in Chinese. This is impressive to see the gap between this year and last year celebrations. 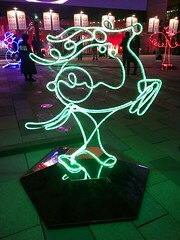 It was really difficult to find a Christmas tree or some Christmas lights in 2011. 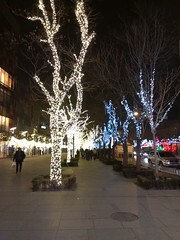 This year, all major shopping areas (Sanlitun Village, Phoenix Gallery…) and offices installed everywhere big Christmas trees and lights. The shopping markets also sell lights and small trees to decorate homes. The locals start to be concerned by Christmas spirit. Several colleagues plan to give some gifts to their kids on Christmas’ eve. I was really astonished when I discovered a “laughing cow” box written in Chinese in the mini-market closed to my apartment. 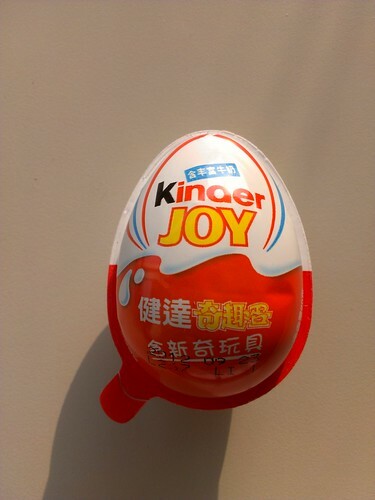 New surprise yesterday when I found one of my favorite sweets in Europe, the Kinder Egg.